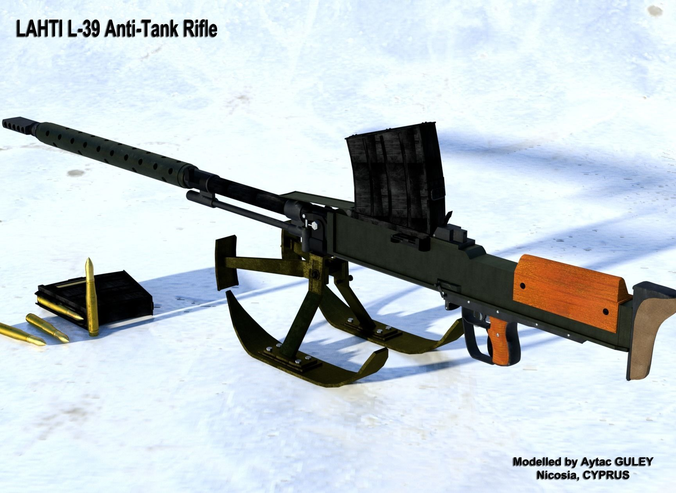 Lahti L-39 (Norsupyssy) Anti-Tank Rifle 3D Model has been modelled in Blender 2.78 Cycles Render. It has been modelled by the help of reference pictures and by watching videos about Lahti L-39 in youtube. Length of 3D Model is almost same as the real one but for other parts, there may be some small differences from the real one. All parts of Lahti L-39 Anti Tank 3D Model modelled from references by remaining faithful to the parts on real Lahti L-39 reference pictures. The model is a low poly model but the 3D model is not prepared as ready to subdivision for this reason, any subdivision application may deform the model unexpectedly. On the other hand the model has been rigged and almost all moving parts of real Lahti L-39 move on 3D Model too. The FBX and Obj formats of the model have been exported from Blender 2.78 but has not been tested. For FBX, I can assure that there won't be any problem but for OBJ format, I am not sure 100%. In case of any problem, please let me know, I will work on it and prepare it again within at most 24 hours.